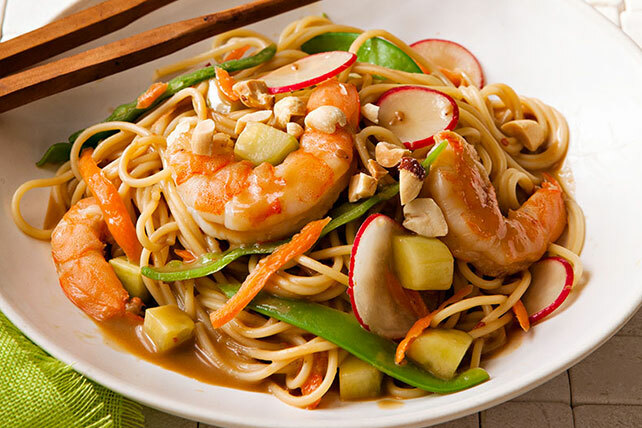 Toasted sesame dressing, peanut butter and soy sauce give this delicious shrimp and vegetable pasta stir-fry its Asian-inspired flavor. Mix first 4 ingredients until blended; set aside for later use. Cook pasta as directed on package, omitting salt. Meanwhile, heat oil in large skillet on medium heat. Add shrimp; stir-fry 2 min. Add vegetables; stir-fry 2 min. or until shrimp turn pink and vegetables are crisp-tender. Remove from heat. Drain pasta. Add to shrimp mixture along with the dressing mixture; mix lightly. Sprinkle with nuts.